Seduced by the Wolf, Terry Spear's fifth paranormal installment in her werewolves series was released this week and Terry is paying a return visit, to of course, talk about werewolves. Each book is a standalone and doesn't require you to have read previous volumes in the series. The series style is a perfect curl-up-on-the-couch paranormal romance and a mystery thriller. I am half-way through Seduced by the Wolf (review to come) and am enjoying it thoroughly. If you would like to win a copy of the book, just comment on Terry's question at the end of the post. The giveaway is open internationally until August 11 at Midnight EST. What’s Wrong with Werewolves, Anyway? Fantasy/SciFi/Paranormal/Futuristic readers are in a realm of our own. I grew up on Star Trek, fantasy, shapeshifters, and the paranormal. What’s normal for me is not to others. But in the beginning, I didn’t know that. I thought everyone loved going beyond the realm of our daily existence and exploring the world beyond us. That’s what I thought. All the childhood tales I read, the Greek mythologies, and folk tales from all around the world were wonderful fantasies. I thought that since everyone I knew read them as children, everyone loved every aspect of the fantasy world. And then I became a writer. I learned some agents didn’t like fantasy, or science fiction, or paranormal, or futuristic worlds. What was wrong with them? Didn’t they grow up on the stuff? And then I learned that some publishing houses didn’t like any of that kind of work either. Strictly fictional or nonfictional based on reality. It’s sad. Really sad. It’s not that I don’t like the real world, or love reading about it. Even in Seduced by the Wolf, I incorporated a true story about a gray she-wolf with a litter of pups that lost her mate to a hunter. 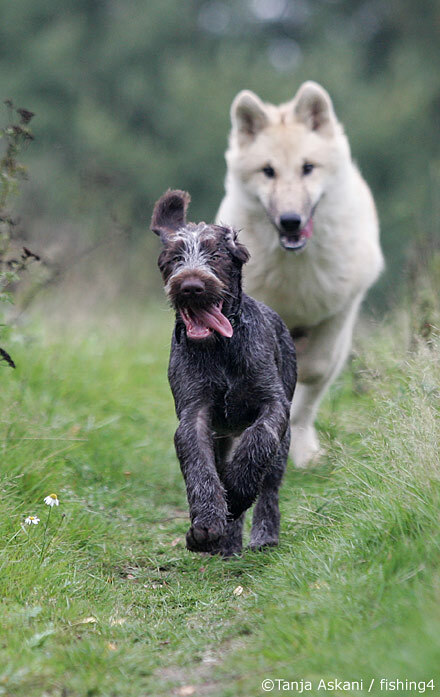 Without a wolf biologist to intervene, her pups would never have survived. And the true wolf tale even had a happy ending that so touched me, I had to include it in the story—my version, of course. In the true version, a male wolf babysat her pups when they got loose from the pen, and when she was released to the wild, he became her mate. Talk about a perfect mate. So in Seduced by the Wolf, Cassie Roux is a red werewolf wolf biologist who educates the populace about wolves. But in the meantime, she comes upon a female red she-wolf with pups and must help them to survive. Throw in Leidolf Wildhaven, who had taken over an abused werewolf pack earlier on and has troubles galore, who once he catches sight of Cassie has a new mission—make her his mate. When I first started telling folks I was writing historical romance, they were okay with it. I live in the Bible Belt, so even romance is frowned upon to an extent. But when I began writing vampires and werewolves? Oh my. I smile a lot when I talk about my books. So people naturally respond with a smile, usually. Sometimes, they’re speechless. Sometimes it doesn’t matter to them and they think it’s great that I’m published. Sometimes, they love them and can’t wait until the next one is out. Today as I was checking a patron’s books out at the library (I was wearing one of my wolf t-shirts that I wore to a book signing at the RWA National Conference in Orlando this past week), a man said he loved the shirt and loved wolves. He’d raised a she-wolf (full blood) and her litter of pups when his roommate left them with him. So I shared the reason I was wearing the t-shirt, and we talked about wolves for a while. Another fan raised 9 full-blooded wolves and three others that read my series raised wolfdogs, or wolf-dog hybrids and found a connection with my wolves/werewolves as much as they did with their pampered wolf pets. One was the beta of the pack, while the dog-dogs ruled. Who knows? Maybe someday my books will help the wolf species a little. Where did I get my love of wolves? Initially from Jack London’s tales, White Fang and Call of the Wild. 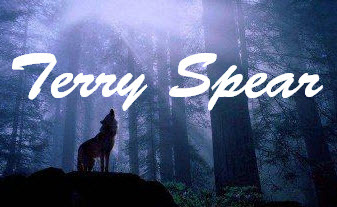 And that’s what I hope to convey in my own stories—a love of nature, of wolves, of the wild, all the while encouraging readers to take a walk on the wild side into the fantastical world of werewolves where adventure, mystery, suspense and romance are par for the course! Thanks so much to Doug for having me. I’ve missed you and your blog!! And thanks to readers who drop by to comment. My question to you is if you were trying to sell something that was a bit fantastical to someone who wasn’t into that sort of thing, what would you do or say? The next book in the series, Wolf Fever releases December 7. I'd tell them to just give it a shot.you won't know if you like it unless you try it.I have friends like that..I always have to push books on them and they always come back and say thanks for making them read it. I would tell them it is for all types of people who give it a try. I believe having an open mind allows one to find lots of unexpected good things. I would tell them that if they had no expectations then they might get a nice suprise by trying something new. Hi Terry. Great post. Your book sounds good. I would say "Give it a try. You might be surprised and love it. It never hurts to try something new. " I would tell them that even though it is fantasy, it's still about interactions with others and that's universal. That if they try it, they just might find that they love it. I love the fantastical so much, I try to win people as converts whenever I can, LOL. Hi Terry! Love the series. You know the old saying " You never know until you try " It's always fun to take a look at something new, you might actually like it. Thanks for the contest! Hi Terry - If this is a person I know fairly well, I'd present it in a way to showcase the things that I know that do appeal to them. That's how I was convinced to enter into Urban Fantasy. A blogger reported that a book had this, and this, and that so I picked up the first one just to see. Next morning, I was waiting for the bookstore to open to get the other 4 in the series. Sounds like I am trying to sell to my husband, LOL. I usually tie the fantastic into something the person likes or understands and make comparisons between the two. I usually try to talk about good parts without mentioning the fantasy and then drop it in once I have them interested. I would tell them to ignore the genre label and just read the book - it's great and they'll be surprised if they drop their preconceived notions. bkobsessed17--ooh, I love your idea!!! You never know when you might make a fan who would not bother to give the story a try otherwise! Barry, oh, I love that quote!!! Excellent! Barbara E, I agree. Good points. One of my co-workers just turned 21, and I was astounded to learn he wasn't into fantasy, what with so much of it being popular nowadays. He wasn't even interested in Lord of the Rings, or Harry Potter, or Narnia, or anything like that. He'd never read Hansel and Greta or any of the childhood fairy tales. Really sad. Good points, Robin! Is your husband not into fantasy? :) But I do love what you had to say. SaraC, I agree. I was reading a book on wolves, but not expecting to learn anything other than a few more details concerning their behavior when I came upon the story I based Seduced by the Wolf on. We never know what we might discover when we sit down to read a book! Sorry about the deleted comments. I kept getting an error message that my comments were too long. I just got home from work so am behind! I would concentrate on the other aspects of the book. For example, UF books usually include either a mystery of some sort, a romance, or both, so I'd focus on that and downplay the fantastical elements, just to get them to at least try it. I'd explain that that they absolutely could not live without it while smiling big and showing my canines. I love your books! so happy to see you're enjoying the new one Doug!! The author wrote maybe 3 of them, they were a huge failure, and the reason was her romantic suspense fans weren't ready for vampires, and vampire would-be fans didn't have a clue she wrote them. So sometimes, it doesn't work. But then again, maybe if they'd given fans a heads up, they would have tried them anyway. :) Or not. But at least they could have targeted a market that was more accepting! :) Today, they'd probably be a huge success if marketed properly! I was on a literary blog (not set up by me) one time, and the fans of the blog were really condescending because: number one--I wrote romance, and number two--I wrote werewolf romance! This was before the big upsurge in Twilight and some other big hitters that have filled the silver screen. 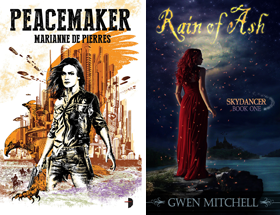 So I went to my Fantasy, Futuristic and Paranormal RWA chapter to gather the forces of writers who love the kind of writing I love, begging them to show how much they loved the realm of the paranormal and fantasy and we turned the tide. :) We literally won the battle. The naysayers dropped back into the background and didn't say another word! :) And I had a great blog tour! Hi Terry! Loved the post! I'd probably tell them that they might get surprised, so they should try it anyway, even if it doesn't seem like their type. My friend has that book and he told me that I must read it. It is has an amazing and exciting story. This post is so great. I want to have the giveaway. Hi Larissa! Thanks!! Good advice! And I'm thrilled Doug is enjoying the book! Ooh, Silent Raven, I like your handle! :) Reminds me of Edgar Allan Poe! :) Nicely ominous. I agree with you. I really emphasize that the werewolves are like real wolves. I've had a lot of wolf/dog fans who have given the series a try. Woohoo, thanks so much for sharing, Dining Table! :) I'm thrilled he loved the story! Good luck! Back in the SciFiGuy groove! Yeah!!! Many times when I speak to people, they look at me as though I was saying something "fantastical" (stop snickering, Doug). I just look 'em in the eye and speak from the heart. That's my story and I'm stickin' to it! Terry, I have your first four "Wolf" books, and I am so excited that there are now four more books in the series. 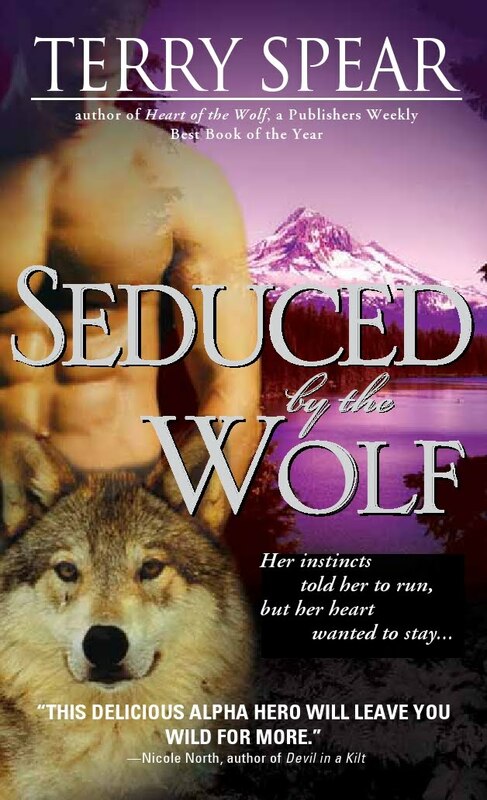 "Seduced by the Wolf" sounds sensational! Try it you might like it. I wasn't a paranormal reader. Until one day I picked one up about a Elf who was locked out of his under forest home. That fantasy world really gave me peace and relaxation. So now I love Shifters, Wolves, Vamps, Demons. And especially Terry's books. I loved your story, Donna! Now see, I thought you would have loved fantasy from an early age. There's hope for nonreaders yet!!! Thanks so much for loving my stories! congrats on the release :) I would tell him or her to try it out! trying something new could never be bad. I suppose in the past I have put it in terms of "normal" things, for example: When trying to sell my passive aggressive, hyper sensitive roommate on Romero's Night of the Living Dead, I tried to speak about the way it was finding creative ways to deal with issues of racism and sexism. (She was not sold) But I also write about Werewolves and I recently came across this question: "Aren't you just writing about Furries, then?" And to that I responded that my characters weren't sexually driven fetishes, they were real people insofar as that is the way they are represented and it shouldn't matter what they can do and what kind of creature they are, since the stories are what matter more. I agree, Ina! Thanks on the release! Yes, Ammy Belle, plot and characterization matter a great deal. If it lacks either, the story, no matter what the genre, can be lacking! In order to convince that person, I would dress up as one of the book's characters and visit that person! Hmm, now that's an interesting thought, Tracey! Thanks for sharing! As I have told you before, I love your books. I am crazy about wolves and werewolves. I love the way you describe your wolves and werewolves in your books. Thanks, Julie! I'm thrilled you're enjoying the series! You are definitely welcome in the pack!! 1) it is exactly like (insert something they love) only better/more exciting/witha cool twist, etc. 2) remember the last time you didn't want to try something I recommended and you ended up loving it? Trust me with this one too, give it a chance. 3) just give it a chance you could quit if you don't like it after the first few chapters/bites/sessions. Stella, great ideas! I had to chuckle when you came to the part about bites. :) Thanks for sharing! I tell people with closed minds that a closed mind is a closed life. Life is meant to be lived and experienced and to have a full life it is important to try new things regularly. Who we are today is an accumulation of chances and choices we have made in the past. Also, living life in limbo gets old pretty fast!! Books and Bane, Yes, so true!! I can't imagine not trying new things and adding to the memories with new experiences. It's the unique experiences that make life memorable. I'd tell them the truth and if they don't believe me, then so be it. Hopefully if they re a friend, they would know my word is trustworthy. Sounds good to me, Meredith!! !